Gardner: It seems that the adoption of technology now seems to be moving at the volition of the savvy consumer, not the IT director. Roche: If we look at some of the economic trends, you'll start to see that folks who went to college 20 or 30 years ago got out of school with the expectation of working their way up a corporate ladder and adopting technology and tools that were provided by the corporation. The fol ks who are coming up these days have been weaned on technology. A really big mega-trend is that our workers of today and tomorrow, not us who are already in the workplace, those folks coming up, are going to not just demand technology that will enable their work and their life, but they will expect it and indeed may not be able to function as well without it. Gardner: How do you see the economics of this shifting and pushing the adoption patterns that enterprises need to try to catch up to? Roche: It's funny, because in many ways it has become a numbers game. Some of these applications or businesses price their products at low or no cost -- with the objective being conversion to paid, either subscriptions or paid services and advertising, but also the value of the connection, the value of the social network as part of the business model. Organizations or enterprises today are going to be taking philosophies like that and applying it to more traditional goods and services in the marketplace, where the value isn't necessarily on the initial transactions. It’s not about a 99-cent Angry Birds [app]. It's about what happens once you're using the technology, the product, the service, the relationships that you form, the advertising, and the knowledge that can be shared. Gardner: So we have this cauldron of bubbling and churning change. What is it that you think organizations need to try to do in order to be on that advantageous side of shifts, rather than find themselves at a disadvantage? Roche: A bunch of things. Let's start with the big picture. Organizations that are truly instant-on enterprises are those that serve their constituents, customers, employees, partners with whatever they want and need instantly, at any point in time, through any channel. So organizations that are instant-on, and those are the kinds of organizations that we need to evolve to, are going to explore better ways to run business and government by designing new process and methods, by building flexible systems that interact with greater personalization. I think back to 10 or 15 years ago, when we were talking about mass customization and the science fiction world that was all about personalization of every transaction and every purchase. Companies are going there. I think companies will also need to look at frameworks for transacting efficiently and securely. Creating a framework for this instant-on enterprise will enable this whole idea of everybody on, and the prosumer, the professional, and the consumer coming together as one person, one view, with two different sides to them, two worlds. Governance is going to become ever more important. There are certainly legal and ethical goals and constraints. Creating a framework for this instant-on enterprise will enable this whole idea of everybody on, and the prosumer, the professional, and the consumer coming together as one person, one view, with two different sides to them, two worlds. That's going to have to be where organizations move to support. Gardner: Help me understand about how you at HP are looking at this. It seems to be a terrific opportunity. Roche: HP has a long, very cool history of being really innovative, but at HP today, our vision is to provide seamless and context-aware experiences for this connected world. Just by way of example, at HP it's not just about prosumers, folks like me doing personal activities during work hours and work during personal hours. It's about these personal activities evolving into becoming work activities. I'm not just messing around on YouTube because I like looking at the latest videos. I'm working You Tube, because that's where our HP Channel is. It’s one of the places where our HP Channel lives and it's one of the ways that I communicate with my clients. The same thing with Twitter and Facebook, and indeed even this podcast, speaking with you. These are prime examples of things that we at HP place a very high value on and our technology infrastructure has been overhauled to support that. The other interesting thing about HP being well-positioned to do this is that we have a depth and breadth of both services and products that meet almost every requirement of this new instant-on enterprise. Certainly, we would never expect to see an HP-only environment. We are very, very focused on what's right for our clients and our customers. But, the fact that I can reach back into my toolkit of HP brain power and HP Labs and our various products and service units and gain access to the information and the mind share that my clients need, is a hugely valuable tool to have at my disposal. Gardner: What about the technology consulting organization? The way our services are structured, we're designed to meet the various needs of transforming to an instant-on enterprise. Roche: Let's talk a little bit about what all clients should look for in a consulting organization. The way our services are structured, we're designed to meet the various needs of transforming to an instant-on enterprise, I mean that is the entire backbone of how we have structured ourselves. If you look at our Converged Infrastructure team, for example, we have folks who are not only designing services to support a converged infrastructure, but we have folks who are looking at helping organizations create a transformation vision for what it means, how to get there, what your roadmaps need to look like, or how mature are you as an organization. One of the things that we like to do a lot and, in fact, anyone considering working with a consulting partner should look for this as well, is to help folks understand their own maturity. I'm not talking about the traditional capability maturity model. We certainly we can do that, but we like to look at things in a slightly different way. We like to look at organizational culture and the risk profile of that organization. That’s unique to how we work at HP. If I look at an organizational maturity model, we're looking at where culturally folks are going to be placed in terms of how they want to take a risk. Are they a science-fiction type organization where they're comfortable being on the bleeding edge, extremely early adopter organizations. I've got this taxonomy in my brain from way back when I was an industry analyst and we used to talk about future organizations, which are these early adopter IT organizations, not bleeding edge, but willing to be early adopters. There are the folks that are in the mainstream, and then there are the stalled IT organizations that look to deliver IT support, rather than moving to enable the business with IT and to have a seat at the table and to be not just a provider but an actual broker of services. When you're a broker of IT services, which is what we teach our clients to be, you are providing not just IT support, but you're also providing new cost models for business process enablement. You're looking at things like service delivery in one of three ways: traditional, which is in-house or outsourced, private cloud, public cloud. At HP Consulting, we believe that you're driving to create a service portfolio that drives a value chain. And the value chain delivers these services to the consumer, customer, citizen, via whatever channel is most appropriate -- web, chat, IM, etc. Gardner: When you focus this problem set through a consultative solution or methodology, it’s really experiential, a tribal knowledge. It seems to me that the consultative function is perhaps more important when we come into this period of change. We've been working really hard to make sure that we share our experiences, and to capture that tribal knowledge, to systematically input it into places where others can access it. Roche: It’s one of the things that is pervasive throughout HP Consulting, that it really takes a village to deliver services and top-notch innovation to our clients. Every time I walk into a client site with a team of consultants, it’s not just one of us working independently in our area of specialty. It’s about all of us working together. It’s about that tribal knowledge. We've been working really hard to leverage the innovation in the field. So we need a really strong knowledge management capability. We've been working really hard to make sure that we share our experiences, and as you say, through tribal knowledge, to capture that tribal knowledge, to systematically input it into places where others can access it. And, of course, all while respecting the privacy and the non-disclosures we have with our clients. When I walk into a healthcare organization to start working on a digital hospital activity, let's say, I've got the knowledge of all the folks who have come before me, including our long history of innovations. The bottom line is that if someone says to me, what's very different and special about your team walking in versus someone else's team walking in, I'm going to say it is the depth and breadth of HP that's behind me, including the way that we work with our customers and partner with our clients to bring the depth and breadth of HP to bear in every engagement. Gardner: So we're crossing chasm of consumer to business. You really need to have almost a behavioral, empathetic, sympathetic approach to bringing people into change. It's not easy to change. Roche: No, it's not. And while it may seem a little trite to say it, if anything is going to derail a project, it's going to be resistance to change, lack of a good change management strategy, and lack of executive support and governance. The cool thing about this whole instant-on enterprise approach that we are taking is that we do actually have a taxonomy for change, and the taxonomy is both social and technology, and it basically is a way to connect all these different constituents to meet their needs. The taxonomy itself says, if you're going to transform to an instant-on enterprise, the first level of the taxonomy is looking at the business and government requirements. Within IT, the best practice today seems to be all about alignment, business IT alignment. We think that it's really not about alignment, but it's about taking that next step towards empowerment and empowering the business with IT. That means becoming a strategic service broker. That's the third level of this taxonomy. 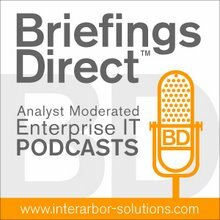 To be a strategic service broker, you need to look at disciplines like converged infrastructure, security, information optimization, application and infrastructure transformation, and look to deliver those through those three service delivery mechanisms we spoke of earlier -- public cloud, private cloud, or traditional delivery, which includes outsourcing. Build those up into a service portfolio and roll it out in terms of services that are delivered. We do actually have a taxonomy for change, and the taxonomy is both social and technology. Gardner: How about some examples of how this can work when it's pulled together properly, when you have the alignment of services, consulting, technology, business buy-in, and so forth? Roche: We actually have several great success stories with clients and I'm going to start with one client, Black & Veatch. We worked with them recently to deploy a unified communications solution from Microsoft that, for them, is going to pay for itself in 18 months, which is pretty amazing when you consider that we did this, basically creating a virtual environment to help Black & Veatch solve their client’s problems. We worked with the client to design a unified communications solution and configure the architecture. We set up an infrastructure, including servers and load balancers and the like. We tested our Unified Communications software and voice, and we obviously are using voice over IP (VoIP). We did all sorts of enhanced service desk and helpdesk implementations. And we also provided our own helpdesk -- or we set one up for them that was staff by HP to resolve issues during the cut-over. We did lots of training to help the users adapt to the new systems. After we put in place new converged technologies like IM and Mobile Access and desktop sharing, we replaced their phone system, and we gave them integrated fax and voicemail and email. We ended up reducing the risk of their outages through lots of built-in redundancies. We did this all in about 20 weeks. As I said, they expect this project will pay for itself in 18 months, and essentially we gave Black & Veatch the ability to communicate and collaborate internally and with their customers around the world. We worked with another client recently as well to provide them digital healthcare and digital hospital capabilities, that included things like video, telemedicine, that included the converged infrastructure to support voice and IM and other things like that. We also worked with them to provide automated client case-management technology. I'm speculating a little bit, because some of the decisions haven’t totally been made, but imagine nurses walking into patient rooms carrying HP TouchPads, for example, rather than lugging the big heavy carts that nurses today do when they are doing automated medical records. It's really cool stuff like that, but again speaks to the whole nature of the prosumer. We're working with education, a couple of education organizations, and in one instance working with some speech therapists to use tablet devices and handheld devices to help students with speech problems throughout their therapy. Rather than use flash cards, they're using specially built software that students can touch and listen to and things like that. Again, it's this integration of consumer and professional capabilities. The idea that you have is provisioning that might look like app stores. Applications might look like apps on your device. Gardner: One of the big things of course with the economy still being tough in many regions is how to do more with less. Is there a continuing economic incentive or I suppose even an engine of adoption that we should expect in the future, Liz? Roche: Absolutely. In fact, I might even go so far as to call it an economic imperative. You talk about a harbinger of things to come, and I would say look at this whole reemergence of this prosumer trend. When I say reemergence, I'm talking about back in the '80s when Alvin Toffler first made up the idea that there is a convergence. He wasn’t calling it a professional, but he was calling it a producer and a consumer. If we take that and look at how it has evolved into this notion that one person with a separate consumer and professional life is over and that we are looking for convergence, that’s the harbinger. The idea that you have, as you said in your introduction, provisioning that might look like app stores. Applications might look like apps on your device. But as we see technology continue to increase in its velocity, as we see more and more technology adopted into our homes earlier and more deeply embedded into everything we do. That’s where we are going to see the future go. Just think for a minute about our pets. We're embedding our pets with microchips that have not just their name and their address, but maybe if they have got some medical risks, they are on there. I think we are going to start seeing things like that, that tight integration, maybe not embedded in our bodies, but certainly medical records, certainly integrated payment devices, the idea that paper money goes away and we have one card that does every thing. Organizations that aren’t at least thinking in that direction are really going to miss the boat. To connect further with Liz Roche, visit her at her micro site.